"Intermediate jewelry artists seeking new design possibilities can learn step-by-step instructions on how to wire-wrap using faceted stones, how to create pendants with any size or shape or faceted stone, how to use several methods of working with and setting faceted stones, plus mixing wire gauges and tempers to create stable and creative pieces. 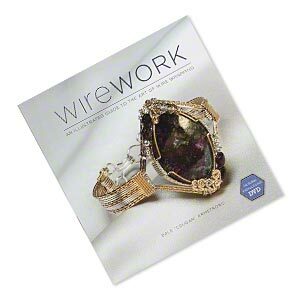 All the basic techniques being used are also demonstrated on the included DVD, giving you a solid base for creating the 18 jewelry projects in this book. You?ll learn: How to work with half-hard wire; when to use other tempers and why. Dale?s favorite tools and proper tool usage. Using geometry in wire-jewelry functions; making the ?right? right angles; shaping with & without mandrels; using ?found? items for shaping; when and how to use snap-set components; choosing the right cabochons & gemstones This book will challenge artists to be creative, think outside the box, & transform jewelry into their own style. Softcover, 128 pages, measures 8-1/2"" x 9""." THIS BOOK ALSO COMES WITH AN INSTRUCTIONAL "DVD"